According to Herotodus of Bodrum, the first man to write a text of world history and therefore the “Father of History,” the Kaunians were a prosperous people afflicted by a scourge of malaria, which gave them yellow skin and yellow eyes. Some of the inhabitants of whom he spoke may be found today in the tombs for which the village is now known. Wandering through Kaunos you will also see some interesting architectural meshings accumulated over the centuries and combined with elements from the Greeks, Lycians, Carians, and Turks. 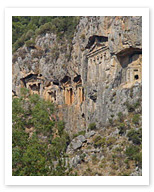 The city’s prosperity came to an end long ago with the silting of the Dalyan River. Today, tourism may help to bring it back.